Meet Ms. Noreena Shams -an awesome Young Leader, the Iron Woman in Sports from Lower Dir, Khyber Pakhtoonkhwa! Enough is Enough! Sixteen Days of Activism! 2018 Ending Gender Based Violence Against Women in Pakistan! Noreena Shams was born on June 18, 1997 in Timergara, Lower Dir District, Pakistan. She raised the money to buy her first squash racket and shoes by selling her cartoons to the local newspaper. She lived in Lower Dir with her mother during the war, and her house was struck twice. At the age of 15, Shams disguised as a boy to play cricket, and played for a whole year on the national junior team, and then ended up in the girls’ team when her identity was revealed. She joined the academy as Noor-ul-Islam but that was not her idea. “My coach who was a blessing for me at that time, gave me his name and declared me as his son in front of everyone. He cut my hair and made me dress like a boy to play in the under-15 boys cricket team of that time. It was no less than a dream for me,” she added, talking about her days as Noor-ul-Islam. She played for a short while on the cricket team before moving onto squash. Shams has been a sportsperson since 2008. She was the first ever cyclist to win a silver medal for Pakistan in the Junior Olympics. Shams has played different sports and has won 63 gold medals, 24 silver medals and 5 bronze medals. As a squash player, Shams has been among the Top 40 Asian Junior Squash Players, and is currently ranked 209 in the world. She is currently World Number 212 by the Professional Squash Association. She is coached by Munawar Zaman, Shahzad Mohibullah Khan, Adil Khan and Tariq Khan. “I didn’t have proper coach, I didn’t have enough finances, I didn’t get courts to practice,” she mentioned when asked the difficulties she faced as starter in squash. “My passion kept me going. I would practice on any wall I could see, be it in the house, in school or outside my training academy,” she said. It has been three years since then, Shams has got herself recognised and a place in Women Squash Ranking and has had the honour to be the first-ever female sportsperson from Malakand Division in the past century. “I have represented Pakistan at every possible international event I could have.” Shams won silver in cycling at the junior olympics and is the youngest South Asian to do so. 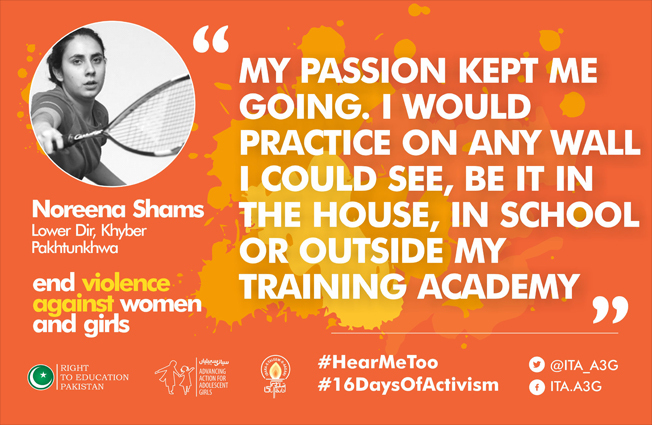 In her own words, Noreena said “What always encourages me to pick sports over everything is that it gives me the unstoppable energy, which I never get when I am doing something else,” Shams said. “It gives me the confidence to be myself. It is that intense desire that I never had. It is the passion that speaks for me wherever I go. I can pick sports a thousand times over everything”. According to her, the biggest hurdle female sportspersons in Pakistan face is that they have to show that they are empowered.